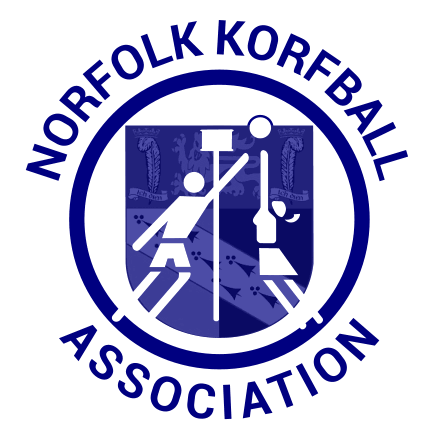 For the 2014/15 season there have been some additions to the Norfolk Korfball Indoor League Rules. 4.6.2 – Clubs must enter the result on Fixtures Live within 48 hours. Full team lists and scorers must be entered on Fixtures Live within 10 days. 4.6.3 – Failure to enter results and full team lists with referees and shot clock operators onto fixtures live within the deadline in rule 4.6.2 with incur a warning on the first instance, a £5 fine to the club in the second instance and a £10 fine to the club for any further instances. To be reset at the beginning of each season. Division 1 teams must also enter type of goal when putting on scorers. 3.3.1 – With the exception of teams playing under rule 3.3.3, a maximum of 2 higher team players are permitted to be on the field at any one time. If a team cannot meet this requirement then they must forfeit the match. Players may only play down by one team. Division 1 matches will be played with a shot clock. It is the responsibility of the home team to source a shot clock operator. Payment of shot clock operators is at the discretion of individual clubs. This season we will be videoing matches to go on the NKA website. Clubs need to inform the NKA if there are any members who do not wish photos/videos of them to go online. U18’s must have parental permission.